All cars are Full comprehensive insurance including passengers liability with the excess as specified below and unlimited mileage. Insurance Drivers from 25 year of age & over. Built before the famous standing stones at Stonehenge, the two temples making up this remarkable UNESCO World Heritage site have an extraordinary history. Built between 3600 and 3200 B.C, they fell into disuse around 2500BC and were not fully revealed to the modern eye until the nineteenth century. multimedia show portraying a gastronomic journey and the beauty of Gozo; Tour of the tomato processing plant, the dairy and cheese-making centre and the artisan workshops; free sampling of food & beverages produced in-house; traditional crafts in the making; an old Gozitan kitchen gallery; agro-tourism lectures on traditional local farming & crops; lectures on the nutritional values and cooking methods of Maltese culinary dishes and heritage; hands-on cooking classes with local chefs; the making of cheeselets, infused oils & vinegars, wine and vinegar-making and more wine-tasting experiences; customised dining & events. The best place to start is the Visitor’s Centre, a new place that is providing an audio-visual presentation about the Cittadella. The presentation is very informative and can be appreciated by visitors of different ages. There’s nothing to stop you from visiting as the place is very accessible and there is no entrance fee. This article is about Ramla Bay in Gozo. There is another Ramla Bay near Marfa, Mellieha (Island of Malta). Ramla Bay is located at the bottom of a rich and fertile valley on the northern side of the island of Gozo. Gozo is one of the Maltese islands. The village of Xagħra, located on one of the hills of Gozo, overlooks this valley. It is about a forty-minute walk from Xagħra to the bay. The bay can also be reached from the village of Nadur. Bus service to the beach is very regular. The terraced walls built by the farmers give the valley an appearance of a quilt when viewed from the high ridges surrounding it. Joe Xuereb was born on 26th June 1954 and lives in Ghajnsielem, the first village the visitor meets after landing in Mgarr harbour. He studied art at the Gozo Lyceum but his career really launched itself off in the 1970's, after working and studying under the tutelage of the late British archaelogist Marie Claridge, then active at her 'Gozo 20' studio on the outskirts of Ghajnsielem. 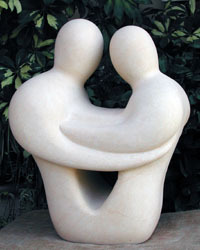 He discovered his artistic inspiration in Neolithic sculpture, a field rarely exploited by other local artists and over the years, though his message has cut across universal boundaries, has made his reputation by specializing in this type of art.